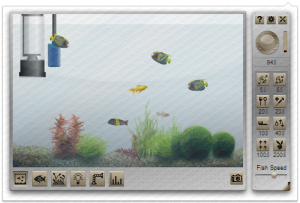 SimAquarium is an aquarium simulation game – you can buy and sell fish, aquarium sceneries (plants, rocks etc), lighting and other things for your aquarium! You can play with your fish, feed them and more. To earn money you have to breed and sell fish – there is 28 different species with different characteristics, some of the fishes are very rare. With more money you can buy bigger and prettier fishes, more impressive aquarium decorations and better lighting. But the most expensive animal you can buy is not a fish – it’s a dolphin! If your fish not show just wait for second, close then open again. 186 Responses to "SimAquarium Extensions"
Can you make the source code open source at github? The money code changes daily or more, so there is truly no permanent money code. how do you feed fish!? Hey you cute we should hang sometime!! can you have something where the fish earn money every day that you have to come back and collect or something bc i have 3 fish and i am broke! you can collect money every hour. view configuration and click add money. what are all the icons for the fish info? I don’t see the code anywhere on this page! When you’re in the app, type in random stuff into the “add money” box, click add money, and it will take you to the right page with the code above the video. Where do i put the code in at?? it’ just below the picture of the fish tank and writing. What is a code that gives us money? what? can’t find the code.PLEASE HELP ME!!!!!!!!!!!!!!!!!!!!!!!!!!!!!!!!!!!!!!!!!!!!!!!!!!!!!!!!!!!!!!! where can i find the code on the site? I only have one option on configuration and that is relax mode. What gives? Relax mode pause the game, but you can still buy and sell things and watch the fish in tank. Can you save and reload an aquarium? In case you have to reboot your computer, for instance. puede obtener dinero cada hora. ver la configuración y haga clic en añadir dinero. I have simaquarium version 2.1.6 and it doesn’t have insert code like the app does, but I haveboth, where is the update? Thanks Very much. I guess I’m stuck with 2.1.6 .
what do you do whem the heart gage is low? is there a limet to how many fish there can be? is there a full screen option? can I set the aquarium as my screensaver? how do you insert codes? how does one acquire more money!! I need more fish. I'm hosting a dinner party tonight and how am I supposed to feed a group of 10 with only 2 tiny fishies swimming around in there?!? I cannot seem to find the option to “sell” the fish I no longer want, where might I find this? Click on the thing with the little graph, it will show your fish. If a fish gets sick don’t waste money buying medicine for it. Just sell to a customer (tell them the fish is healthy) and change the water in the fish tank so none of the other fish catch any grotty diseased fish germs. My tank is getting polluted super-fast. What should I do? Hint: Replace the Southern Platyfish with the Zebrafish when you can. Both breed fast, but the Zebrafish is worth more. you can check configuration after 1 hour playing game. Better yet, buy up to 6 of the cheapest fish (more fish = more breeding = more $!) and let them breed and breed. Just keep your food up above 0% and watch out for pollution and sick fish. Sell off your sick fish (ones with low health) first. I like to keep about 10 of the cheapest fish and sell them when they get too abundant. I am just starting the game but I assume as you move up in cost of fish they get harder to manage and require more attention, medicine, better water filters and the like. Aaargh! can’t change background from transparent to another thing! 228 births and 2 deaths… whew! não consigo salvar o jogo… e também não consigo ganhar dinheiro de hora em hora. o jogo é salvo automaticamente quando você comprar peixe. round button is setting for relax mode (pause game, but you can still watch fish) and for add money every hour. if fish not show, just wait for second, close then open again. this problem from initialize data. How do u breed fish? How do I play with the fish? When do they breed do they just do it on there own? I have no idea what the code is, please tell me! Satria, I was wondering how I could get the game code. I had it earlier in the yer like in October. But, now I don’t see it on this website. I was wondering if you could put the game code back on there. If you do I might just make this game go viral again in mys school! thanks! THIZ IZ A CULL GAIM I RILY LICK IT, ITZ SOOOO GUD! How do you breed fish? …or you could use the cheat code. Yes, but if you wanna speed it up you can buy breed hormones. is there any way to keep your aquarium clean? Like if you get a different filter, will it keep your tank cleaner, longer? How do I feed the fish?????? how do u get money?!?!?!?!?!?!? howvdo i keep my fish from dieing and how do u play with team? MY FISH HADE A BABY!!!!!!!!!!! When does appear the dolphin? what is the money code i am stuck. i would like to know how to add money to the game..
do you have to purchase anything? How much does the dolphin cost??? My fish seem to die really quickly.. I add food and clean the tank.. What else do I need to do to keep them alive longer? why don’t I get any money at? what is the money code for today? All I want is the code where is it? I want more money. What’s the code to get money? ?